Sans. krimija, Ar. and Per. quermis dūd al-gurmīz, Fr. kermes, MEng cochineal, Eng. kermes, (crimson). 1. worm producing crimson dye. 2. a red dye made from the dried bodies of the females of the Coccus ilicis (kokkos in Sicily), a scaled insect, found in Mediterranean regions. Kermes were used for coloring dūd al-sabbaghin (Islamic and other feast day) dishes. The dye was produced by boiling the insects in water and then letting the water evaporate. It was used also to dye fabrics until replaced by cochineal insects, which were found superior. The 12th C “Textile of Eagles” made from kermes with tannin in the cathedral in Siguenza is a noted example. Medicinally, the insects were mashed into to make a syrup called “alkemes.” It was thought to cure cardiac problems and stop fainting fits and palpitations. It gave physical and mental strength, cured melancholy and was an aphrodisiac as well. In the beginning of the 19th C, it was still highly regarded. Napoleon’s doctor carried a briefcase filled with kermes powder when traveling. 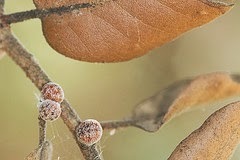 3. kermes oak or holm oak scrub L. Quercus coccifera on which the insect Coccus iticis feeds. The scrub normally grows to about one meter in height but can be as tall as two meters. Its shiny green leaves have sharp spiny edges like holly. 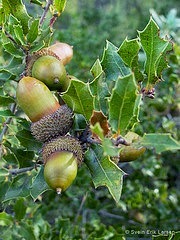 In the spring, acorns appear which take two years to ripen and are picked in late summer or early autumn. Although sour and bitter, pigs do eat them. Galls, wood like-balls, form on some of the branches. The insects lay their eggs in them. In this way, the insects do not destroy the branches. Medically only the bark from young trees is used although the leaves and galls can be applied for their astringent properties. For diarrhea and hemorrhoids, the bark is drunk in an infusion. For external use, a decoction is made with the bark to treat hemorrhoids especially those affecting the female sexual system. Juice, extracted by crushing the acorns and soaked up in compresses, is applied to reduce inflammation.